Nausea and body feel not fresh. Pain or pain in muscles. The rash becomes small bumps that itch. The bumps then turn into nodules that are very itchy. After 1-2 days, the nodules will dry out and become the scabs that will peel themselves. Not all nodules will pass through all three stages simultaneously. Generally, there are pimples that are still wet, while others have dried up. Keep in mind that there are some people who have more severe chickenpox. Immediately contact your doctor if there are unusual symptoms such as chest pain, difficulty breathing, the skin around the nodule becomes red and felt sore due to infection, as well as dehydration symptoms of dry mouth and rarely urinate. Chicken pox caused by this varicella zoster virus can be transmitted very easily and quickly. Transmission can be through direct contact with the person or through a splash of fluid during a person sneezing or coughing. You are even considered to have been exposed to chickenpox virus if you have had direct contact or had one room with a person for 15 minutes. Have not received chickenpox vaccine, especially pregnant women. Have a weakened immune system, such as contracting HIV, using steroid medications, or undergoing chemotherapy. Work in public places such as at school or hospital. Babies, especially newborns, who have mothers who have not received chickenpox vaccine. People with chicken pox usually do not need to undergo tests or medical examinations for the diagnosis process. 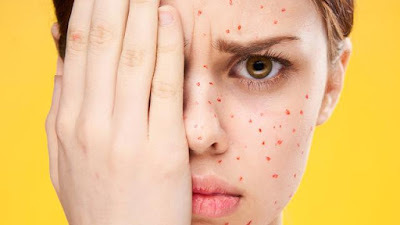 You are most likely to have chicken pox if you have major symptoms, such as a mild fever followed by a rash appearance. Red puncture due to chickenpox also has a significant texture, making it easily recognizable. Pregnant or lactating women, people with weakened immune systems, and babies under the age of one month should be examined by a doctor if they have symptoms of chicken pox. Diagnosis and treatment as early as possible are needed to avoid the risk of complications. Doctors can also perform simple blood tests to confirm your symptoms and see if you have immunity against chickenpox or not. The presence of chickenpox virus antibodies in the body indicates that you are already protected from the disease. But if you do not have it, your doctor will monitor the progress of the condition. Also read: What you don't know yet About The Chicken Pox Disease.